Need Seekers – These groups actively listen to their customers, partners, and clients to understand what will offer superior value to the market. Market Readers – These consist of teams that analyze and predict market trends to capitalize quickly on new developments. Technology Drivers – These organizations deploy technology to solve problems, even those that are not fully articulated, to disrupt or improve market efficiencies. In reality, companies often make strategic commitments to a specified plan of action without a full understanding of their own capabilities and competencies. A mismatch between capability and competence levels can turn what could have been a successful launch into a missed window of opportunity. Academic research suggests that success in innovation is strongly linked to organizations with capabilities in acquiring new sources of knowledge, rapid reskilling/relearning, and flexibility in adapting to market shifts. Even organizations that have these capabilities might not be able to deploy them at the competency level required for a flawless execution. While an organization as a whole may display these capabilities, competency levels among individual team members are normally widely disbursed. These team members and their managers may not even be aware of how objectively competent they are at executing the above KSFs prior to the project launch. 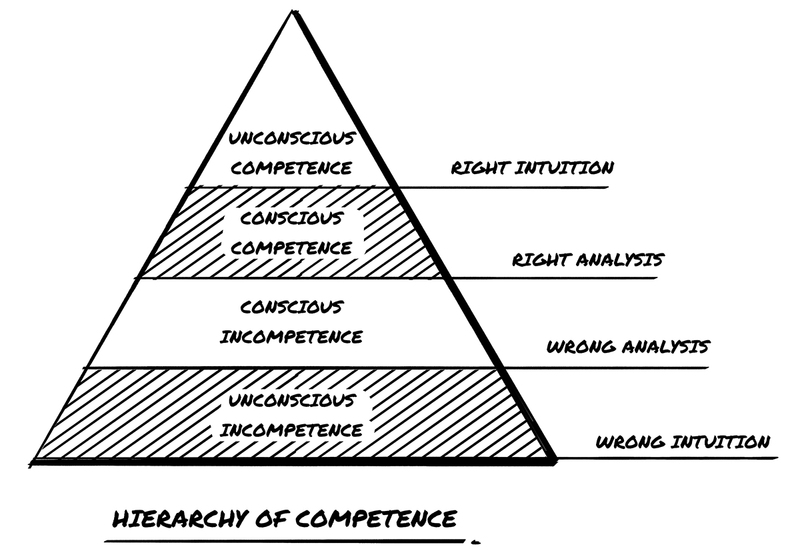 As Buch’s pyramid points out, individuals at the base are not fully aware of how unprepared they are. As they gain experience, they begin to see how much they have to learn and can benchmark competency more accurately. Near the top, they are fully competent in the task, but tend to perform without thinking about it, which complicates knowledge transfer. We have found that these challenges are more pronounced at knowledge-intensive enterprises, where team members often are brought into projects with their own agendas, theories, ingrained habits or perceptual confusion. This affects larger enterprises more because their projects involve a wider variety of team members from more varied backgrounds. Enterprises needs time and preparation to handle the mix of competency levels. Even managers who are highly competent within their own spheres might not be aware of how much work must be done to ramp up their leadership, capabilites, and compatenicies prior to a truly innovative initiative. Contact Innovation360 for a full evaluation of your organization’s capabilities and detailed assessments of competency levels in mission-critical skills.